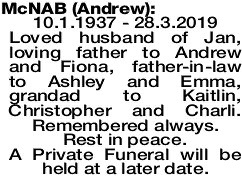 10.1.1937 - 28.3.2019 Loved husband of Jan, loving father to Andrew and Fiona, father-in-law to Ashley and Emma, grandad to Kaitlin, Christopher and Charli. Remembered always. Rest in peace. A Private Funeral will be held at a later date. 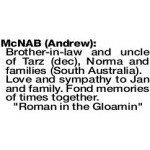 Brother-in-law and uncle of Tarz (dec), Norma and families (South Australia). Love and sympathy to Jan and family. Fond memories of times together. 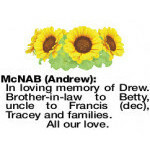 In loving memory of Drew. 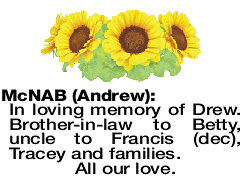 Brother-in-law to Betty, uncle to Francis (dec), Tracey and families. 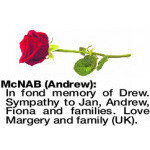 In fond memory of Drew. 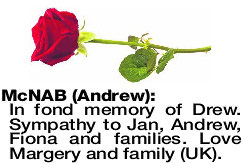 Sympathy to Jan, Andrew, Fiona and families. Love Margery and family (UK).